If you are moving from LoadRunner to JMeter you might want to convert your existing tests into JMeter format. This article will guide you through the process, so you will be able to perform the transition smoothly and within minimum time. An easier way to convert is to use this free and quick converter from LoadRunner JMeter or BlazeMeter. Read more on how to do it from this blog post, or try it out yourself. JMeter comes with a built-in proxy server that enables intercepting HTTP requests that flow through it, and then converting them into HTTP Request samplers. 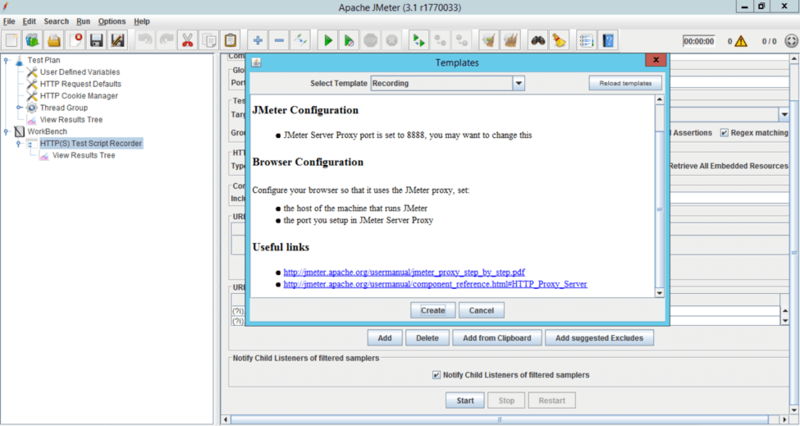 The easiest way for setting up JMeter for recording is by using the JMeter Templates feature. JMeter can be setup for recording in just a few clicks. Just choose “File -> Templates -> Recording” from JMeter’s main menu and then click the “Create” button. JMeter will populate a Test Plan that is suitable for HTTP(S) traffic recording. All you need to do is expand “WorkBench -> HTTP(S) Test Script Recorder” and click the “Start” button. Once you click the “Start” button JMeter will show you a message telling that a certificate was created in JMeter’s “bin” directory. This doesn’t indicate any error, it is just an information message regarding the ApacheJMeterTemporaryRootCA.crt certificate creation in JMeter’s “bin” folder. If you are recording HTTP traffic - you can just ignore it. If you are about to record HTTPS traffic - you will need to install the certificate in your browser or mobile device, see the Recording HTTPS Traffic with JMeter's Proxy Server guide for more details on it. If you didn’t change any default settings, JMeter’s proxy should be now running on port 8888 of the machine where JMeter lives. 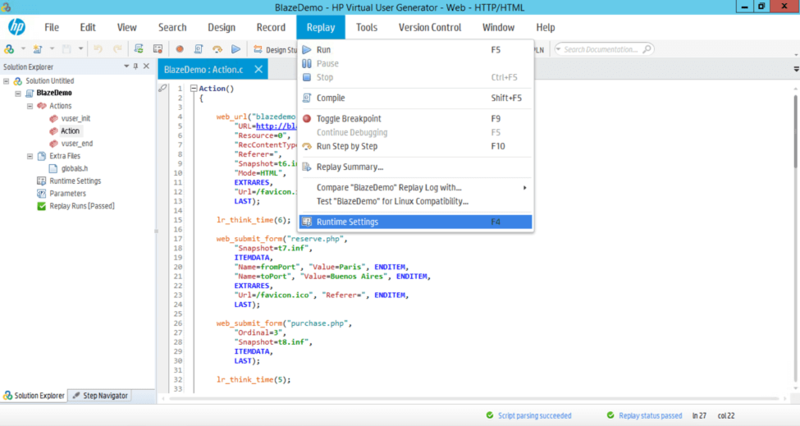 The whole idea of converting a LoadRunner test to JMeter is replaying a test in LoadRunner by using JMeter as a proxy, so JMeter can capture the requests and convert them to its own Test Plan format. Therefore, you need to “tell” LoadRunner to use JMeter as a proxy. - HTTP Proxy: enter the IP address or hostname of the machine, where JMeter is running. If VuGen and JMeter are running on the same machine - type localhost there. 5. Just in case, double check you have 1 iteration under “General -> Run Logic”. There is no need to record test iterations, it is better to handle them in JMeter on the Thread Group level or with a Loop Controller. Once you have test script “skeleton”, you will most likely need to manually correlate dynamic values by using JMeter PostProcessors (Regular Expression Extractor, CSS/JQuery Extractor, etc). 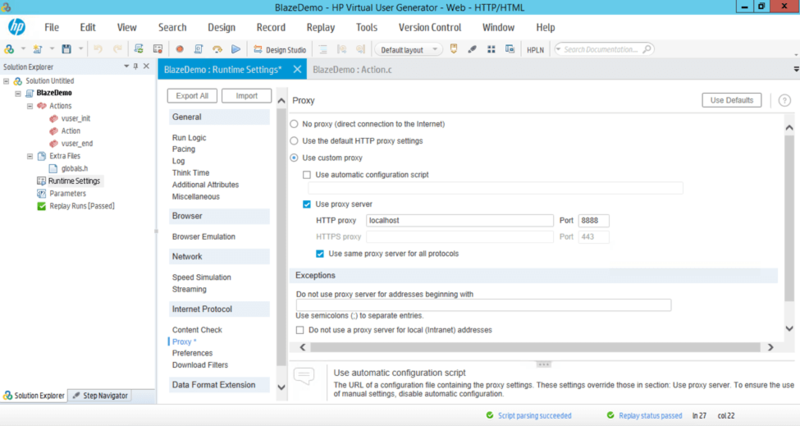 OR you can use the BlazeMeter Proxy Recorder instead of JMeter’s HTTP(S) Test Script Recorder. BlazeMeter Proxy Recorder can export tests in “SmartJMX” mode. This mode it will automatically detect any dynamic parameters and generate the relevant test logic to substitute hard-coded recorded values with the ones extracted from previous responses. This way, you won’t have to take any extra actions. See this How to Cut Your JMeter Scripting Time by 80% article for further details. 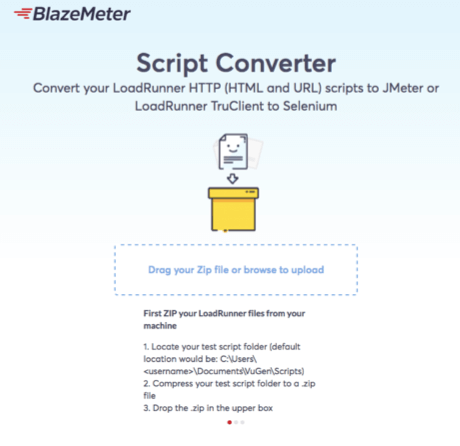 An easier solution is to convert your scripts from LoadRunner to BlazeMeter or JMeter through this online conveter. All you have to do is upload your script, and the converter will do the rest. You will be able to easily download your converted scripts and run them in the tool of your choice. Learn more about how to switch, here. To try our BlazeMeter, which will provide you with everything JMeter does as well as scalable tests, collaboration and insightful reports, put your URL in the box below and your test will start in minutes.